How Does Google Rank Blogs? Recently, our blog search team made it much easier to find full blogs about your query, rather than single posts on the topic. This is especially useful if you’re looking for bloggers that post on an ongoing basis about the subject of your query. — This week in search 8/27/10, The Official Google Blog. The Google patent describes how the search engine might rank blogs, by collecting information from a blog’s feed and from the blog itself to attempt to understand what a blog might be about. It may collect information such as the content of posts, post titles, post authors, blog authors, the blog’s title, profile information about the authors, blog roll information, and possibly other information about the blog. Rather than focusing upon ranking individual blog posts for a particular query, the focus of this patent appears to be upon determining whether a blog itself should be ranked for that query. I’m not sure how big a change this is to what Google has been doing in the past, but the change that is indicated in the Official Google Blog does provide some new information about blog rankings that we haven’t had access to before. How new is this change and why does it matter? 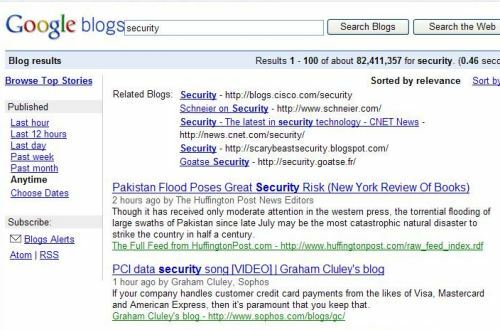 If you start a search at Google’s home page for the term “security,” and then choose “blogs” in the left sidebar, you will see three blogs listed at the top of the blog search results under a link that says “Related blogs about security.” You will also see three blogs listed at the top of the results on security, and then a line separating those links from results that appear to be a ranking of individual blog posts about security. If you start a search for “security” at Google’s Blog Search home page, the results are different. You don’t see a link at the top for “Related Blogs about security,” but you do see an indented list of five blogs at the top of the results after a text label of “Related Blogs:” Those results do include the same top three blogs listed when you arrive at those results starting from Google’s web search. But, the last two results shown in this list of “related blogs” are different. I’ve tried a few other searches for some additional queries, and the results do seem to be different, though with some overlap of results, when you start at Google’s home page compared to starting at Google Blog Search. Google Blog Search has been showing “related blogs” at the tops of blog searches for more than a couple of years. Are those related blogs being ranked differently than the homepage blog results we see when we arrive at Google Blog Search after starting from Google’s home page? The differences in the results showing presently indicate that they might be. It’s possible that the changes that we see when starting at Google’s home page might be mirrored in future results when starting at Google’s Blog Search at some point in the future. It’s possible that Google may have changed more than an interface. The algorithm used to determine related blogs may have changed somewhat as well. One nice thing about this change is that we can now see a possibly much longer list of “related blogs” or “home pages” on topics that we search for, and get a sense of how close a blog home page might be to ranking to show up as one of the top three homepages at the top of those search results. A system may receive a feed associated with a blog. The system may extract information from the feed and the blog and create a hybrid document based on the extracted information. The system may further use the hybrid document to determine a relevance of the blog to a search query. The patent itself is interesting for a number of reasons beyond its apparent focus on helping to find blog home pages. It was filed on the same day as the patent application that I wrote about three years ago in Positive and Negative Quality Ranking Factors from Google’s Blog Search (Patent Application). It also shares the same list of inventors, so these two patents are very much related to one another. There isn’t a lot of overlap in the published descriptions of the patents however. As I mentioned above, this patent appears to focus on helping to find blogs rather than blog posts. Say you wanted to find a blog from someone who writes about life in Virginia rather than someone who wrote a blog post about a trip to Virginia. The approach in this patent is intended to help you find the blogger writing about life in Virginia. 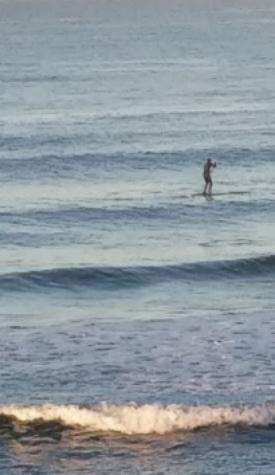 The other patent filing is intended to help you find the blog post about the person taking a trip to Virginia. This patent, for instance, might look at the profiles of the bloggers and notice that they live in Virginia, where the other patent wouldn’t. It might collect other profile information to use in indexing as well, including age, gender, etc. It might also look at other types of information to create a blog homepage rank, including content from the blogs’ feed and from the blog itself. These can include authors’ names, post titles and content. For example, if the post content extracted from the blog feed does not match the post content extracted from the blog/post documents, this may be an indication that the feed and/or documents are not legitimate. That is, an individual may be attempting to spam a search engine into ranking that individual’s blog/post more highly than it would ordinarily be ranked. In this situation, no hybrid document may be formed for this blog/blog post, or be given a very low rating. The patent describes how it may create a “hybrid document” about a blog out of information from both XML feeds, blog posts, and pages linked to from those feeds and posts such as profile pages. But it doesn’t return those hybrid pages in response to a searchers query. Instead it may return a link to the blog’s home page, or possibly even to a blog post based in part upon the information found on the hybrid pages. It’s possible that Google has been using a process like the one described in this patent ever since they started showing “related blogs” in Google’s blog search. The new “posts and Homepages choices” in Google’s search interface that is available when you start your search on the Google home page, and then switch to Blog Search makes it more visible, and allows you to see more than just the first result. It’s possible that the different results that we see when starting at Google’s home page for “related blogs” are calculated somewhat differently than the “related blogs” we see when starting at Google Blog Search. This newly granted patent may give us some clues as what Google might be looking at in both approaches, such as the possibility of Google looking at associated profile pages to learn more about the bloggers associated with blogs. Still needs work! I very rarely use G’s blog search. Still seems like it doesn’t do that good of job with geographical markers. I know more local blogs exist, I’m just not seeing them in blog search though for the relevant keywords. Reminds me of /Places. Some of the keywords my listing shows up for baffles me! I did like that this patent mentions that they would look at things like authors’ and blog owners’ profile pages to look at things like where they say they are located, to make it more likely that those blogs might be seen as more relevant for a location. I think Google’s blog search still needs some work, but I think it might be getting better. I’m curious – do the keywords that your listing show up for appear on some of the other pages of your site, such as a profile page, or another page linked to by your blog? That would seem to fit in with the patent if they do. As it is right now though, there are at least two different ways (two different kinds of algorithms) that Google uses to rank blog posts – they can show up in blog search, and they can show up in Google’s web search ranked not so much as blogs, but rather as web pages. No, not at all! They were borderline on the opposite side of the “safe search” and I have no idea why they would display my business listing on anything like that unless the geographic location of the searcher had something to do with it. Maybe, it could be from something linking to my blog, but they wouldn’t be links I want pointing to my site! None of my live anchor text reflects those keywords, perhaps it is from surrounding copy then? If anything, it could be from FB or Twitter links as I don’t really see language like that on any sites besides those two. That’s really interesting about two different algo’s for blogs. It makes complete sense! I just wonder if there is a way to capitalize on blog search, or, if there is even enough people using that to use a separate-specific strategy. I think there is a way to capitalize on blog search, im just not sure how many people even know that it exists. I honestly never paid attention and if i search for a blog i just add that keyword after my search phrase. How do these patents work? Can Google roll out these new technologies and patent them whenever they feel like it or are these technologies patented before they are rolled out? I do use Google’s blog search in searching related/possible blogs to get a link from. Though I don’t see any advantage through it, except for getting exposed to other bloggers, knowing that “normal users” tend to search for specific topics or ask queries through Google’s main search engine. I think it’s also hard to rank higher on Google’s blog search, since most usually search from the most updated pages (well that’s actually my preference in searching through there). Google Blogsearch appears to offer substantially different results from the “Blogs” filter in Main Websearch. I believe that Blogsearch is a legacy technology that is more dependent upon RSS feed analysis and not as robust as the Main Websearch filter. It would be nice if some Googler explained the difference (although if they say there is no difference I’ll feel compelled to demonstrate many queries that produce different results). @barb, I’m being nosey..a site search for your website URL returns 118 duplicate title results. Each page should carry it’s own title for reader & search engine purposes. Plus, your URLs do not include keywords for any words or phrases you’d like to rank for. Correcting these seemingly small changes may improve your ranking. Interesting article, I had a page rank of 1 but now I dropped the blogspot so i guess I’m starting over? Any tips would be helpful I want my page rank up! seems another step for Google… nice info. Like Jason, I also use Google blog search to find blogs where I can link to. I don’t really know if there’s a big difference with this change but will be finding out soon. Thanks Bill. The need to have narrow focused Blogs/Websites is becoming ever more necessary as illustrated by this Patent. It sure is getting increasingly difficult to rank well in the SERPs for Blogs that cover multiple topics. So it’s looking at the blog as a whole as opposed to individual posts? Sounds very interesting. As you say though, it’s going to make it tougher to rank if you’re a jack of all trades. I’ve wondered the same things mentioned in the article. Perhaps it’s Google’s way of keeping us guessing. As for “One nice thing about this change is that we can now see a possibly much longer list of â€œrelated blogsâ€ or â€œhome pagesâ€ on topics that we search for…” – I’m hoping that this is the case for a better blog search. Now a days every one is looking or new and updated information.. so I think google also optimizing in the same way. depending in the search quarry SE’s searching for new updated content and they are displaying in the top.. This looks useful. I actually find out how you can use it on other queries, that originally do not show the link “Related blogs ..”. You just need to add this “&tbs=blg:1,blgt:b” at the end of the url. Then it shows only homepages for the current query. Too bad I can’t get it to work with web search. Any ideas? Very interesting that Google might be associating your blog with topics that are outside of what is contained in your blog or pages that might be linked to by your blog. Might they be looking at anchor text pointing to the pages of your blog, or text that might be associated with those links, from other web pages or twitter or facebook links? It’s a possibility, but if those terms are the type you describe then that seems like a very odd result, and definitely worth exploring more fully. When a search engine behaves the way that we expect it to, we don’t necessarily learn as much as when it starts doing things that are much less expected. It is exciting that there are two seemingly very different algorithms in place for ranking blogs, and associating them with specific queries. I find a lot of value in blogs for at least a couple of reasons. One of them is that they often tend to provide more timely information about topics than many static web pages. Another is that they often provide alternative viewpoints to more mainstream sites, especially when it comes to news. A third is that many blogs are written by people who are experts in their fields such as Bruce Schneier on security issues, or Ed Felten on innovation in technology. It’s possible that “freshness” carries more weight as a ranking signal for blog posts than for pages that show up in response to a query on Google’s main web search, and that may make it harder to rank well in blog search, at least for an extended period of time. I’d love it if we do see someone from Google step forward and explain some of the differences between Google Blog Search and Google web search with the blog filter. I think you’re right about blog search being a legacy search. I’m wondering if we might see Blog Search switch over to the results that we see in Web search when the blog filter is in place sometime in the near future. My guess is that if and when that happens, we might see something on the Offical Google Blog explaining the change, and maybe telling us a little more about the differences. I guess that’s not surprising that you try to find blogs the way that you do. I’ve done that myself more than once. I think one of Google’s explainations for rolling out Universal Search a few years ago is that many people use Google’s main search and don’t often click on the tabs to see other types of results, such as local or images or blogs even if those might be helpful to them and more in line with what they may actually be looking for. Kimberly’s suggestions to you are good ones. One you make a change like you did, it’s often a good idea to do something like provide 301 redirects from your old pages to your new ones, but I’m not sure how easy that might be in blogspot. For anyone else who might be contemplating moving their site from one domain to another, check out the Official Google Webmaster Central post Best practices when moving your site. Also, if you do a search for something like “moving from blogspot 301” (without the quotation marks), there are a number of tutorials on how to use a redirect to capture traffic from your old blogspot URLs to your new pages and keep (most of) the search engine rankings for those old pages based upon the links that were pointed to them. On increasing your rankings, keeping on creating content that your audience might be interested in reading and make it easy for them to find it, link to it, and refer others to as well. The Google Search Engine Optimization Starter Guide is a nice introduction to SEO as well. For something to be patentable (for a type of patent known as a utility patent, like the ones that we typically see from search engines), it needs to be an actual invention of some type – not just an idea – that is new, nonobvious, and useful. It doesn’t necessarily need to be earthshaking, but it does need to be something that everyone isn’t already using or doing. It’s possible that the inventors, or the company that they work for may develop the technology described in the patent and have it in use for a short time before the patent is filed, or while the patent is pending, but they don’t have to. It’s possible also that a company might wait for a patent to be granted before using the technologies involved. It’s also possible that while the technology described in a patent might be useful, a business decision might be made to pursue a different tangent. It’s also possible that someone might publish a patent not so much to use what’s describe in it, but rather to attempt to exclude others from using the technology. Patents do go through a fairly extended review process to determine if they describe something that can be patented or not, or if what is described hasn’t already been patented by someone else, so Google can’t just patent anything that they want to. It’s also possible that Google might not patent some things, but instead try to keep the ideas as a trade secret, which doesn’t necessarily provide the protection of a patent, but also doesn’t make an invention public like a patent filing can. Those are a couple of very good suggestions. My URLs here aren’t search engine friendly, and that’s a conscious decision on my part based upon the fact that I’ve had lots of links pointed at old URLs and don’t want to spend the time or effort to rewrite each of those independently, and potentially lose some small bit of pagerank based upon those old links having to go through a redirect. But, if someone is essentially starting out fresh, like Barb is, it’s not a bad idea to do. Well, I guess this will make it easier to find those quality blogs that provide us with fresh new information in our fields. Some times it’s quite difficult to find those good quality blogs. I love it when a search engine shares information like that with us, but they don’t often. Sometimes we do see papers from them that do, and I’ll be keeping an eye out to see if one gets published. There have been a lot of things added to that sidebar since it was first introduced. I’m wondering if more people tend to click on those sidebar links/filters much more then they do using the links that appear at the top of Google’s front page to other types of searches. I think this filter is a great idea for a number of reasons. I guess the one that I like the most is that it can make it a lot easier to discover more blogs that focus upon specific subjects. I’ve been starting to see discussions about whether it’s better to have a blog that covers a narrow niche or set of topics, or a blog that is more general and diversified. This patent seems to focus mostly, but not completely, on making it easier to find blogs that cover specific topics, but blog pages in Google’s web search and Google Blog search “post” results still seem to focus primarily upon the contents of a single blog post. So, blogs that do have a narrower focus on specific topics might be more easily found on searches for those topics in the “homepage” type approach in the Blog filter results from Google’s main search, but individual blog posts from blogs that are more general may still rank well in the “post” listings for specific topics if those posts are both relevant and important under Google’s ranking approach. The “jack of all trades” blogger isn’t being penalized here, but the blogger that focuses more on specific topics is becoming easier to find. Exactly. Someone using blogging software, and publishing on a regular and frequent basis is likely to create blog posts that cover timely information about topics, so it’s likely that some amount of “freshness” plays a role in how blogs, or at least blog posts, are ranked. Under the older approach on Google Blog Search, you could only see a few “related blogs” listed. Under this new approach, it’s easier to find more blogs that do focus upon those topics. I think that’s definitely a step in the right direction. I’ll have to try using that additional parameter and experiment a little. Thanks for pointing it out. The patent says that they might look at pages linked to by blog posts and within feeds to learn more about the topics covered by blogs, and specifically mention a profile page for authors as an example, and things like location, age, and gender as examples of the kinds of information that they might look for on those profile pages. It’s possible that they may look at pages other than profile pages, and that they might collect other information as well from those pages – usually patent descriptions only provide limited examples that don’t always unveil every aspect of how something might be implemented. Good point. If you want to keep up with blogs on a specific topic, this can make it a lot easier to find those, and perhaps add them to your feed reader. I know that sometimes I have to learn about a new topic fairly quickly (over days or a few weeks), and I like to find some of the best sources of timely information on those topics. I’ve hunted down blogs and created RSS feeds for those to do that – this can make that effort a lot easier. This will definitely make finding a specific topic or post easier. I often stick to the same blogs, but am very happy when I find a new one that has some value. So how would this affect blogs that do focus on a certain subject and yet contain many posts of personal observations and info that they put in as part of their ‘human face’. As you all know, a lot of business blogs do this. Will this influence them to possibly do less of those personal posts and stick more to the subject focus? Thanks for the background and info on the patent. Thanks for such an informative post. I’ve used Google blog search before, but hadn’t really though much about how it was organized. I didn’t even realize the results would be different coming from the Google web search or from the blog search home! Thanks for the info! This almost sounds like the ranking of individual pages specifically might be taking a step back. Is Google experimenting with simply “pointing us in the right direction”? Has SEO become too efficient at manipulating the results on a page level? Also, I am sure that the number of clicks that related blogs get would also be a ranking factor. As always a wonderful idea, I’m an avid reader and anything that’ll give me more relevant blogs is a good thing in my book. Now, we need to find a way to exploit it for SEO. I have not looked at the sidebar link for blogs. I use Google Blog Search on a regular basis, but I have been disappointed with the results. There are sites listed as blogs, and I cannot determine the reason behind that classification. I also find that when looking for a blog on a topic that I have needed a longer keyphrase to help determine blogs which deal with this specific topic. Maybe this approach will help discover new sites. Hopefully, this sidebar will help with more discovery by users. I think this makes sense. I have a few blogs about very specific niche topics, but sometimes I add posts that are..well, irreverently irrelevant. This approach can certainly help me. This is very interesting, we have been struggling to get our blog pages to rank higher and to show on relevant searches. Our aim was to have our blog assist our website in showing up higher on search results. Nice to read posts like this one. I hope it does make finding blogs on a particular topic easier. I’ve been looking for blogs focusing upon the history of the area where I live, and they aren’t easy to find. I don’t know if that’s because there aren’t many, or because blog search just doesn’t do a good job of identifying them. I don’t think that this patent should convince people to narrow the focus of their blogs, and confine what they write only to specific topics if they also include an occasional post on a different topic. One of my examples in my screenshot the post shows that well. 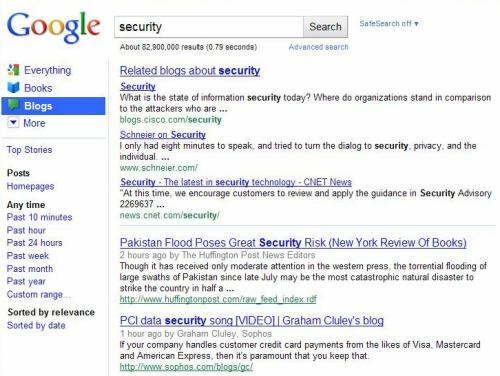 The second result on a search for “security” in Google blog search is Schneier on Security. Every Friday, the author of that blog does a “Friday Squid Blogging” post, where he posts about squids – about as far as you can get from computer security. Yet he still ranks very well for security. You’re welcome. You may not have noticed the difference because this seems to be fairly new. Google just announced that you could visit blogs from a link in their main sidebar on their blog on 8/27/2010. And the results for “homepages” or “related blogs” do seem to be different depending on if you visit through that sidebar link, or you start your search at Google Blog Search. I don’t think this new approach negatively impacts the rankings of individual blog posts. Instead, it’s aimed at helping people find more blogs that cover specific topics – by showing us more of them. The rankings for those seem a little different, but the intent doesn’t appear to focus primarily on specific pages. I like the idea of being able to find more relevant blogs as well, though my RSS feed reader may not – I’m not sure what the limits on bloglines is in terms of the numbers of feeds that you can add. As for SEO, I’m not a big fan of the word “exploit” when it comes to the topic – what I think it can help me most with in terms of SEO is in finding more timely and relevant information on topics that might be important to sites that I may be working with. Thanks. I think discovery (of new blogs on a topic) is definitely one of the best aspects of this new approach. I definitely be interested in hearing back from you about whether or not the sidebar link to homepages has been helpful to you. It sounds like it will probably be helpful to you. I don’t think infrequent off-topic posts are going to be harmful to how your blogs might rank. Thank you. Having a blog can be very helpful in helping the other pages of a site rank well if you can create posts that attract visitors and links and referrals from people who are interested in what you have to say. Hi Bill, as a newer SEO professional, do you think that this patent and Google change will affect the SERPS, and how they rank blogs? I have always heard that blog are great for Google, due to the fact that the content is more dynamic. I believe that it likely already has. It looks like Google is showing more “homepages” for blogs than they had in the past when you view them from the “Blogs” link in the sidebar when starting off from the main Google web search, and those are often different than the three or four “related blogs” that you see when starting off your search from Google Blog search. It’s also possible that Google is using a more complex ranking system than the one described in the patent – the patent is a few years old. Great insight on this one. The related blogs feature definitely helps with traffic if your at the top, but I’m not sure Google has that figured out right. For instance, I would rank this blog very high for SEO, but it doesn’t show in the related blogs. There are 3 good related blogs listed but the 4th one is http://jameseo.com/ based on my opinion I don’t see how it has better content then this blog. Is it just me or does exact url matching seem to matter less to the algorithm for blog searches than for general or “web” searches? I find that fewer keyword compliant (in the primary url) automatically rank well for blog searches than I’d expect for standard search. I’d like to see a study on that, with a very large number of URLs. I’m not convinced that the use of a keyword in a domain is an important ranking factor used by search engines, at least not directly. Having said that, there is some value to having a domain name that uses keywords within the name. Links to a page that uses the domain as anchor text is likely a ranking factor. Use of the domain name in titles for pages, and in the content of pages is also likely a strong ranking factor. But it’s harder to say that the use of a word in a domain name is a ranking factor. As for keywords in the directories and file names that appear in URLs, there’s a good chance that the search engines use those to classify and categorize web pages, and there have been a few whitepapers that describe how. See, for example, Purely URL-based Topic Classification. But there’s less evidence or indication from either patents or whitepapers from the search engines that they use words found in URLs to actually increase the rank of pages for specific queries – it’s possible that they do, but there are no quarantees. Not sure I agree here. I understand we probably attack vastly different search markets in terms of competition – so perhaps it is a larger factor or a more “stand out” one in less competitive realms; but on .co.za even a search term as competitive in relative terms as “web design” shows fully 5-6 of the top 10 primarily placed there owing largely to the “strength”/basic matching of their domain name to the keyword string. I say this having retro-engineered the links for all sites in the top 20 and frankly the domain name keyword compliant ones would otherwise have no right to be there…. Bill on that point – when you download (CSV for excel) from the Google Keyword tool and get a % figure for competition – have you found this figure to be accurate? If so, in relative terms or globally? ie. Surely if [web design] on .co.za is rated at 90% and [web design] in the UK is rated at 88%, then the credibility of the data comes into question (if viewed in absolute terms…)? The Competition column gives you a sense of how many advertisers are bidding for a particular keyword. This data can help you determine how competitive the ad placement is. While the competition figure provided may be useful if you are engaging in paid search, it really isn’t all that useful for determining the level of competition for organic rankings. While you may see domain names that match keywords appearing highly in search results, the reason for those rankings may have little to do with the domain name itself. There are a limited number of domain names available on the Web, and there may be many pages that should rank better for a particular term or phrase than one that happens to have those words within their domain names. For a search engine to give a domain name much weight as a ranking signal would be to reward the first person who was fortunate enough to acquire a particular domain name, and penalize possibly much more relevant sites. Search engines would want to avoid that if possible. There are some potential benefits to having certain terms within a domain name, and those may be instrumental in helping the sites with those domains rank well. For example, chances are good that anchor text in links pointing to those pages include the terms used. Chances are also good that the domain name itself appears upon the pages of the site numerous times. Both these off-page and on-page factors can help a site rank well for the terms used in their domain names. We can’t tell with any level of certainty if it’s the domain name that is causing a page to rank well for a particular term, or these other factors or both. I wouldn’t tell someone not to get a domain name that matches the keywords they were interested in, if it were available and made sense from both a branding and search perspective, but I’m not sure that I would tell them that the reason for doing so would be because the search engines would automatically give them a boost in ranking for those keyword terms on the basis of the domain name itself. I agree with some of the previous commmenters – do people actually click the blog button? Many people may find the information they’re looking for in a blog, but most people don’t expect to find the answer they’re looking for to be in a blog post. Many corporate sites now have blogs that often act as both news funnels and help files for the goods and services that they offer, such as Google, Microsoft, Yahoo. Many questions about the Web, including design, development, usability, and other topics are often best answered by people who do those types of things everyday and blog about them. Many blogs are competing side-by-side with the mainstream media in bringing us news about politics, celebrities, world events, and more, with blogs often bringing us that news both quicker and in more depth. Many people who are experts on security, law, and a wide host of other topics provide blog posts that address current events and insights that we aren’t going to get from talking heads at more mainstream sites. I’m a little surprised that Microsoft/Bing and Yahoo really don’t have blog search, and I’m a little underwhelmed at the blog search that Google has been offering. There’s an old article at Search Engine Watch by Danny Sullivan called Searching With Invisible Tabs that explores a number of the reasons why people don’t often use the vertical searches that the search engines offer, and they often don’t use the blog search. But they do likely expect to see blog results, news results, and other vertical results blended into a main Google search these days. I noticed a couple of comments that say that a keyword in a domain name does not help with ranking. I totaly disagree. Of course it will not guarantee a high position on its own. As one of your readers pointed out, this would put better quality websites at a disadvantage. However if two websites of equal quality were competing for the same term, the one with the keyword in the domain name will win. Using the domain name in conjuction with good on page SEO and off Page SEO can be devastatingly effective. The main reason for not using keywords in a domain name is that it does not enhance brand. Like everything one size does not fit all. There are times when you should consider this action and times when you should avoid it. Before I go, I just wanted to congratulate the author on the quality of both this post and the comments attached to it. One of the points that I was making in the comments is that a domain name by itself will not bring a high ranking on its own, and that it’s often not a bad idea to choose a domain name that focuses upon a brand. I’ve seen some people choose some really dreadful domain names for their sites because they were consumed with getting keywords into those domain names. @Bill Slawski Many blog readers are using keyword in the comment section to get high ranking.Is it helpful or not? I don’t use keyword in comment section.I think that it’s not helpful to get high ranking.Could you please tell me your opinion? I usually delete the vast majority of comments that I receive that insert keywords rather than a name in comments. I think there are an incredible amount of other things that people promoting websites can do that provide much more value to them than spamming blog comments. @Bill Slawski But some blog sites are using keywordluv plugin and blog readers are using keywords with name. I found a great blog post today about this topic and it’s showing the proof. Regardless of whether or not people running blogs use a plugin like keywordluv or allow people to use keywords rather than an actual name, the value of anchor text in a link in a comment most likely is considerably less than anchor text in the main content of a blog post. And, as I noted, I usually delete the vast majority of blog posts that I receive that use a keyword phrase as a name. There are many other ways to improve the rankings of your pages and to attract links to your site, and spamming people’s comments is not only time intensive, but also limited in value especially when it comes to very competitive terms. I agree with you. Thank You for giving me your valuable time and tips. On a whim I went and checked out how my blog ranked in Google Blog Search and was surprised to find I didnâ€™t rank nearly as well for the terms I normally rank for. I donâ€™t use Google Blog Search so I wasnâ€™t aware that its ranking mechanism was different from Google Web Search. At this point, I’m not really sure if Google looks at how well a blog post might rank at Google’s blog search to determine whether or not to blend it into Web search results, or if it often treats most blog posts as if they were Web pages. I think it’s possible that it might do both, but with an emphasis on ranking factors in Blog Search that might focus more upon things like how new and fresh a blog post might be. Now a days top 30 Google SERPs are manipulated… You have to scroll few pages before you can actually find sites which is naturally ranking… Thanks to PageRank and its manipulation. They should NEVER show the PageRank of pages to public. There are a lot of different signals that go into how pages might rank in search results. Google’s been telling us that there are more than 200 of them for a few years now, and PageRank is only one of them. I’m not sure that we could define “natural ranking” at this point if we tried. I’ve written about a lot of these different potential approaches, and I’m not sure that calling them “manipulated” is a good description, because the majority are algorithmic in nature. There are just too many searches for too wide a diverse a set of search results for Google to be manually making changes to query results. Its interesting the tactic that google are trying to use with penguin – It seem’s they are trying to devalue any SEO method which doesn’t result in what could be considered natural links. They believe that SEO guys will then focus on creating content and thing that people want to link to, and natural linking will then resurface. When it comes to blogging, sometimes I feel I am more a copy writer, than a designer or SEO guy. I seem to spend most of my time guest blogging. I think thats what google are going for – A true state of content in king. Perhaps a post-penguin update would be appropriate here! I’m not sure that Google’s Penguin update impacted how Google might try to learn about and understand what individual blogs are about in Google Blog search. It’s hard to say how much influence links even have on these rankings. Not sure about those saying page rank should be private, but maybe that’s just because I like working to get my blogs ranked highly! PageRank is pretty much private, as are most of the ranking algorithms that Google uses. We do get to see PageRank in Google’s Toolbar, but that’s only updated a few times of year, and most of thetime it’s out of date. Next Next post: Apple to Take on Google in Showing Immediate Search Results?